The Big Sausage Week celebration starts here! The week-long event will champion all things great about sausages, encouraging retailers to submit recipes, flavour ideas and marketing tips to help get the public excited about sausage. Over the course of the week, we will be promoting all forms of sausages from around the UK and Ireland, culminating in Champion of Champions 2017. 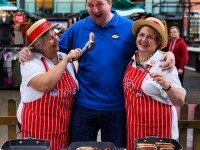 For more on The Big Sausage Week, log on to www.meattradesjournal.co.uk or check out The Big Sausage Week on www.facebook.com/TheBigSausageWeek/ and Twitter at @BigSausageWeek. For more information on commercial opportunities surrounding The Big Sausage Week, contact Matthew Bingham on Matthew.Bingham@wrbm.com or 01293 846 572.